This is a great quote from Haruki Murakami a japanese writer. I thought it was good. I think it is about evil and how if you are surrounded by it you need to open your eyes fully to it to understand it. 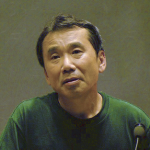 Haruki Murakami, born January 12, 1949 is a Japanese writer and translator. His works of fiction and non-fiction have garnered him critical acclaim and numerous awards, including the Franz Kafka Prize and Jerusalem Prize among others.